All the tracks have been recorded in 1986, the year of commemoration of the 50th anniversary of the death of Federico García Lorca. Includes a leaflet that has lyrics to all of the songs and the original poems of Federico García Lorca both in Castillian and in English. <b>Take This Waltz</b> is based on the poem "Pequeño Vals Vienes" (Little Viennese Waltz), performed in English. Recorded at Montmartre Studios in Paris. <b>Els Negres (Norma I Paradis)</b> is based on the poem "Norma Y Paraiso De Los Negros" (The Blacks Of This World And The Next), performed in Catalan. Recorded at Eurosonic Studios in Madrid. <b>Grido A Roma</b> is based on the poem "Grito Hacia Roma" (Cry To Rome), performed in Italian. Recorded at Forum Studios in Rome. <b>Nacimiento De Christo</b> is based on the poem of the same name (The Birth Of Christ), performed in Castillian. Recorded at Marcus Music, Eel Pie and Parsifal Studios in London. <b>‏ילדותך במנטון‎</b> is based on the poem "Tu Infancia En Menton" (Your Childhood in Menton), performed in Hebrew. Recorded at The Ranch Studios in New York. 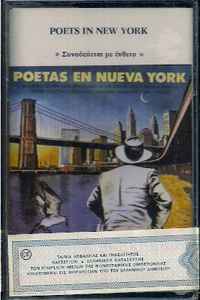 <b>Asesinato</b> is based on the poem of the same name (Murder), performed in Castillian. Recorded at Circus Studios in Madrid. <b>A Aurora</b> is based on the poem "La Aurora" (Dawn), performed in Portuguese. Recorded at Sigla Studios in Rio de Janeiro. <b>Φεύγω Για Το Σαντιάγο</b> is based on the poem "Son De Negros En Cuba" (Blacks Dancing To Cuban Rhythms), performed in Greek. Recorded at Zeta Studios in Athens. <b>Unsleeping City</b> is performed in English. Recorded at Eurosonic Studios in Madrid. <b>Kleines Unendliches Gedicht</b> is based on the poem "Pequeño Poema Infinito" (Little Infinite Poem), performed in German. Recorded at Thomas Funk Studios in Berlin. <b>Oda A Walt Whitman</b> is based on the poem of the same name (Ode To Walt Whitman), performed in Castillian. Recorded at Circus Studios in Madrid.